Notgrass’ America the Beautiful offers history and geography curriculum from a biblical perspective, complete with easy to follow lesson plans. 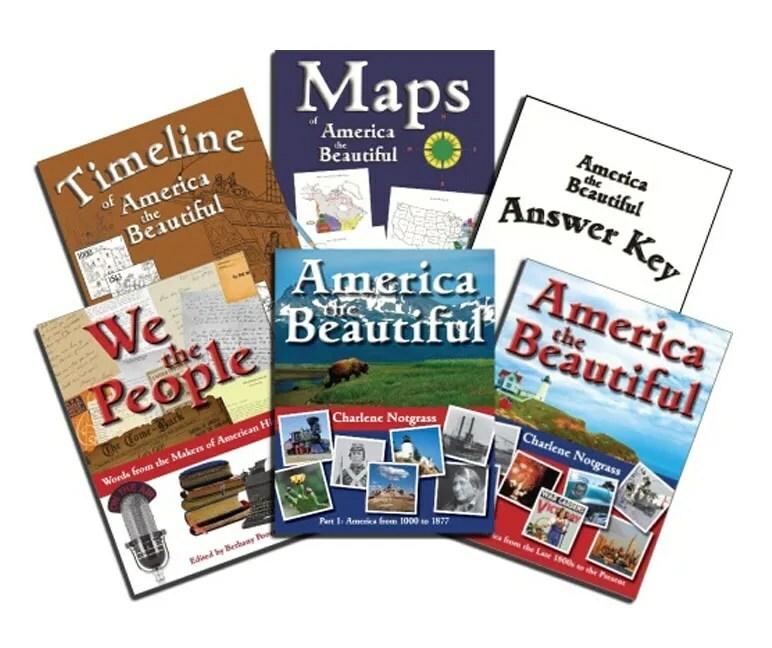 The main lesson books for America the Beautiful come in hardback making it lay open flat for ease of reading and keeping track of your assignments with out closing and going back to find the page you were on. The curriculum is so full of information and photographs that you get 2 books for the curriculum, plus the supplement books in the pack. In book 1 you have 15 units with each unit having 5 lessons. In book 2 you have units 16-30. At the beginning of each unit you are given a list of books you will be reading or using for the lessons. At the end of each lesson you will be given assignments to do that could include reading a literature book, reading in the Timeline of America book, writing, mapping, and other activities. You will find scriptures and memory verses through out what you are studying that in some way relate to what your studying in the lessons. We just love Notgrass and their products. I find them so easy to use and easy to assign. I don’t plan anything out, I just assign the lesson for the day and they know what to do because its right there at the end of the lesson reading. My daughter doesn’t need me to tell her what to do because she can open up to the next lesson and do her reading and all the assignments for that lesson with out me explaining it. I really like this because it allows me to do other things and not have to feel tied to homeschooling all day. I do like to start a Unit on Monday and they start the first lesson on that Monday so they do one lesson per day for the unit. Then if we have a shorter week we will do 2 lessons in a day if possible to help us keep on track for one unit a week. Since there are 5 lessons in a unit, I like it to be that way every week. Its just me being OCD. I enjoy reading the lessons also. We can discuss what was read and see if anything really jumped out at them for further study. The lessons are not all inclusive of course but they give you a good base of the facts. You also get to learn some of the more interesting details other than just names & dates. I did start out using this with both my girls having Kiki (13) using the student workbook and then Dede (16) do the lesson review book. I did not have her write the answers out because I know the girl can do some serious thinking and writing so we did them orally. After a few lessons Dede was asking for her grade level, because this was too easy for her, so I ended up ordering her the high school curriculum from Notgrass Exploring America and she is happy with it. 3 other books included in the America the Beautiful pack are the Timeline of America, the Maps, and We The People. These books are scheduled in the lessons so you know when to use them. Our favorite of these 3 is the Timeline of America the Beautiful. We have actually decided on a fun idea, at least we think its fun, to add in our family ancestors to the timeline so we can see what was going on in the life of some of our ancestors, like my fathers fathers side came over right after the pilgrims, with in a year or two. The map workbook is nice too, but my girls prefer finding things on the globe or larger wall map. At their ages, they think they are too old for coloring in maps, but your child might love to color. I know I still love to color 🙂 So we are using the Map workbook more for reference. I love the photographs in the lessons as they really add a sense of reality to what you are reading about. The photographs are just AWEsome, the Indians (maybe one is our relative), Edison’s lab, steamboats, and my favorite the Biltmore Estate. There are some family activities in the back of the book that are an option for you if you want to do more hands on fun. I really find this curriculum very easy to use and my girls like to use it because they can be more independent about their learning. Now of coarse if you are wanting to be more involved, you can be. You can read this with your kids, read aloud, do the assignments with them or just go over the assignments with them. There is also a literature pack available that includes all the reading books. I want to tell you this story because this is one of the reasons I love Notgrass. It does not have anything to do directly with this review, but it does the company and their customer service. Last year we used Exploring World History from the high school level. Since the literature reading was over Kiki’s head I emailed the company and asked what books I could get for her that would be on her level. The customer service was spectacular. There was a sweet young lady, Bethany, who put together a reading list for us that was age appropriate for the world history topic. I was really surprised that they would give me individual attention like that. I have corresponded with Notgrass a few times over the past year, or more, and they have always been pleasant and helpful. So if you ask me if I recommend the curriculum or any other from Notgrass, I will tell you… ABSOLUTELY! 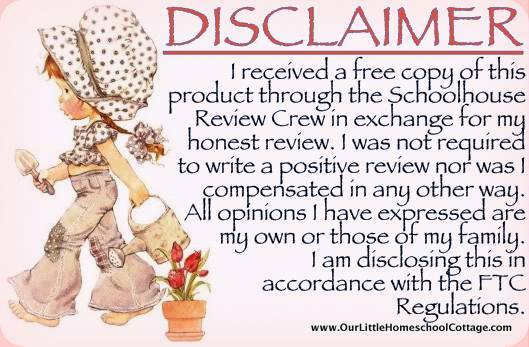 This entry was posted in HomeSchool Review, Homeschooling, TOS Crew Review. Bookmark the permalink. I LOVE the idea of putting family ancestors into the timeline. My parents have done a lot of genealogical research, so that would be fun to relate to our history. We like the timelines too–They're very different from the styles I've seen elsewhere. I just want to share one of our favorite history programs. We have several years of this curriculum and it is still on our “school shelf” for us to use when needed or just for looking something up. Keep Notgrass History in mind while your looking for an easy to follow program. We have used the High School curriculum as well as the middle school curriculum. We love both.